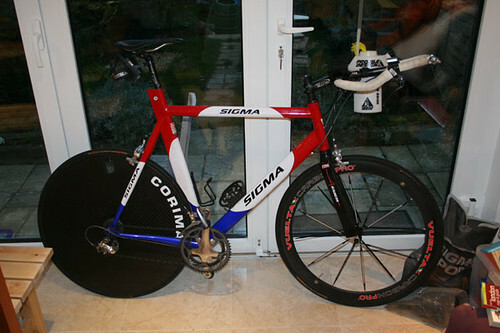 Sigma Kronos with Disc, originally uploaded by rogerbarr99. Above is my race setup for Ironman Arizona with the exception of the tools and tubs I will be taking. Recent additions to the bike that I have been riding for the last 12 weeks are the rear disc (thanks to Kate Foster for lending me this), the carbon front wheel and the profile bottle cages behind the seat. I will be putting my tub and tools in an old bottle and these will be going behind the saddle. The other space will be used for storage when going through aid stations. I plan to re-fill the profile aero bottle with gatorade on the move and also down most of a bottle of water at each aid station. The bike position isnt particularly aggressive but its very comfortable and my back is pretty much flat anyway.